Healthy rice krispie treats–build a better Easter basket for your kids with these naturally sweetened rice crispy treats made without marshmallows and naturally sweetened. In case you’re inclined to think these healthy rice krispie treats are any less delicious than regular rice crispy treats, I want to say that I actually prefer these to regular treats. It’s the peanut butter, man. It’s always the peanut butter, isn’t it? 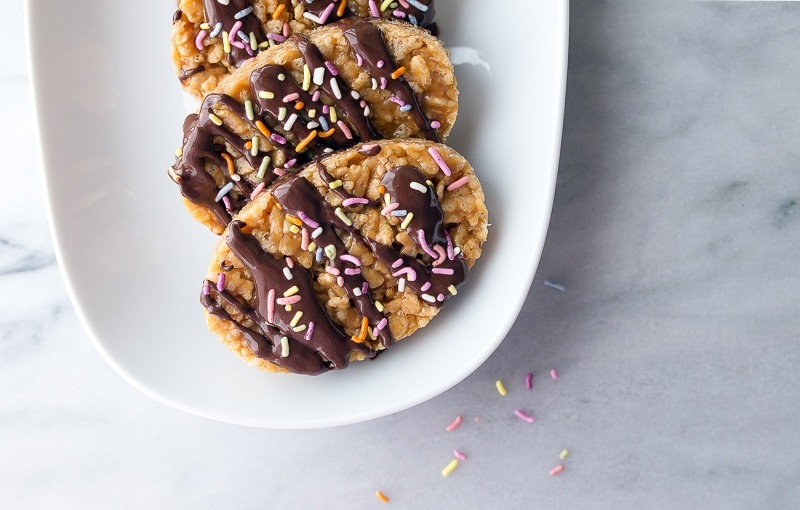 I’ve made these naturally sweetened rice crispies treats for years, but it wasn’t until I realized how perfect they are for my daughter’s Easter basket did I get the inspiration to share them with you. They’re not just for kids that you want to deny/limit sugar…they’re also for adults who don’t want to eat marshmallows, refined sugar, and the like. The recipe comes from my kitchen idol, Heidi Swanson’s cookbook Super Natural Cooking. (And for what it’s worth, I think her approach to all-natural cooking is the stuff of super natural magic. There are a lot of ‘healthy’ chefs out there, but Heidi is doing something wildly different and always has been; I love her so deeply). 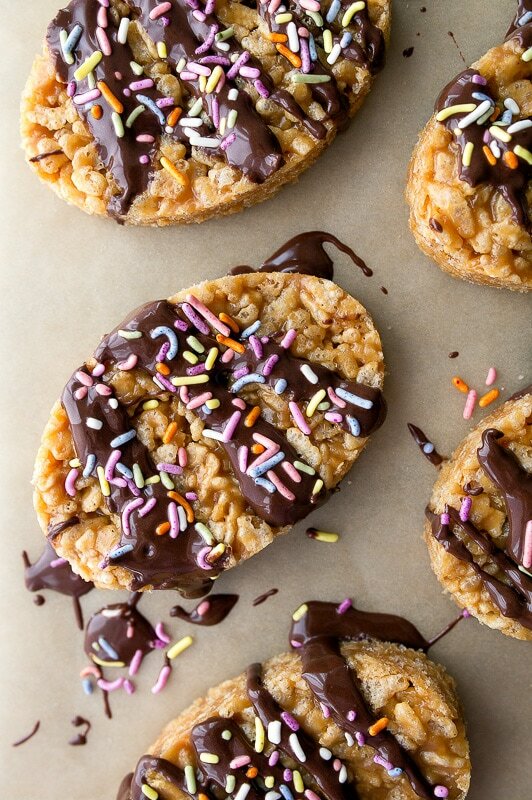 Heidi’s crispy rice treats call for peanut butter, maple syrup, and agar agar (or gelatin). And while it’s completely delicious that way, I’ve been making it with brown rice syrup for years. I used to live on the other side of the Lundberg Family rice fields in California, and so I’ve always had a soft spot for their products. I grabbed a jar of their brown rice syrup to use as a healthy sweetener years ago, and I can honestly say that my pantry has never been without it in nearly 8 years. I use it frequently as a sub for honey, in salad dressings and smoothies, but most of all: I use it to make healthy rice krispies treats. 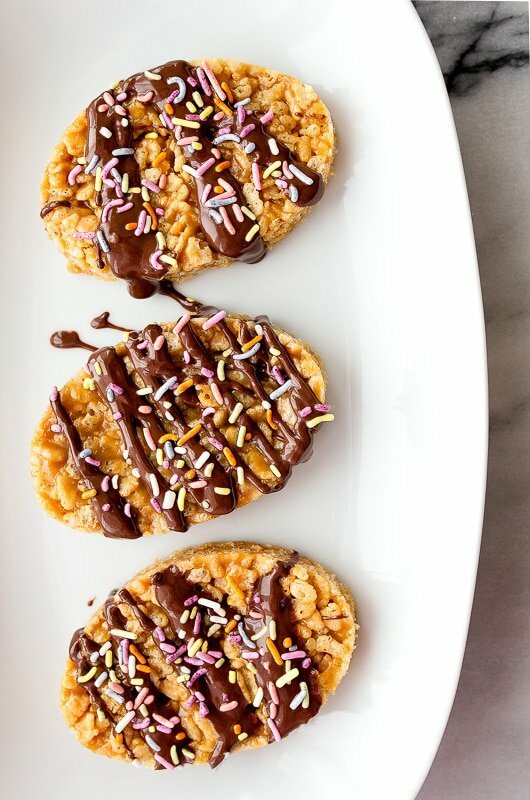 Brown rice syrup is stickier than honey and maple syrup, and STICKY is a very good thing when you’re making rice crispy treats without marshmallows. 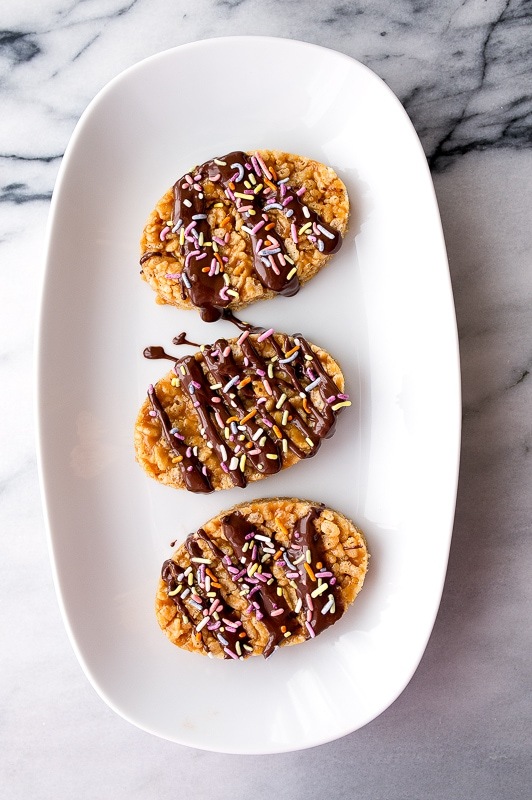 So, these refined sugar free healthy rice krispie treats are made with: brown rice syrup, peanut butter, gelatin (or agar agar), and brown rice crisp cereal, of course. I linked to the brown rice syrup, because it always helps me to see what a product looks like before trying to find it in the store. It’s going to be in the ‘healthy foods’ section of your grocery store, but when in doubt, Amazon will never let you down. Next: peanut butter. It’s a given to use an all-natural peanut butter without added sugar, right? Let’s talk about why there’s gelatin in this recipe. Regular krispie treats have marshmallows, which contain gelatin. It binds things together, and makes them gooey and delicious. Since we’re not using marshmallows today, powdered gelatin is a good sub, however you can totally leave it out. I use grass-fed gelatin (yes, I’m one of those moms), but regular works, too. And if you’re vegan/ plant-based, agar agar is a great substitute. Finally: the brown rice crisp cereal. Honestly, this is really hard for me to find at any store besides Whole Foods. Be sure the box says ‘crisps’ and not ‘puffs,’ as puffs are too soft and won’t give you the same crispy effect. 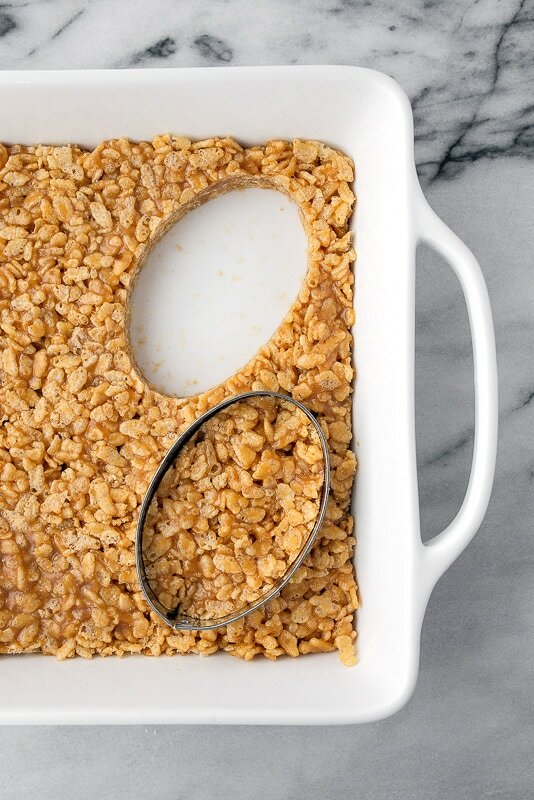 You can definitely use regular rice crispy cereal, too. I’m packing these in Camille’s Easter basket this year. Even though she’ll be nearly 2 this year, I’m still not comfortable giving her candy. If you remember, last year, I packed her little plastic Easter eggs with dried fruit. (I know, I’m such a lame mom). But because she discovered chocolate chips in the pantry one day while my back was turned (and literally asks for them every single day), I decided to drizzle the eggs with chocolate. Actually, now that I think about it, I’ve been giving Camille small pieces of dark chocolate since she was about 9 months old. Chocolate is an awesome source of magnesium, which helps with sleep, and when dealing with children, sleeeeeeeeep is gooooooood. Before you think I’m crazy, I’m talking about 70%+ dark chocolate, which has very little sugar. But the sprinkles. Those have so much sugar. Lame mom status: officially revoked! Hooray! This is a small batch of rice krispies treats, but I smooshed them into a 8×8″ pan, because I wanted the eggs to be thin so they would be easy for Camille to bite through. These are fun to make into shapes for kids (especially egg shapes for Easter! ), but in my house, they’re normally cut into sloppy squares. The fact that I found an egg-shaped cookie cutter to make these for Easter is still blowing my mind. This is going to get me ‘mom of the year’ on Easter morning, right? If not, we’re having bunny rabbit stew for Easter brunch. (kidding) (So not kidding). If you’re stuffing these healthy rice krispie treats into your kid’s Easter basket this year, her’s another fun Easter basket idea –> my two-ingredient homemade fruit leathers! Sugar free rice crispy treats made with peanut butter. Lightly spray a 8x8" baking pan with cooking spray (or rub with butter), and set aside. 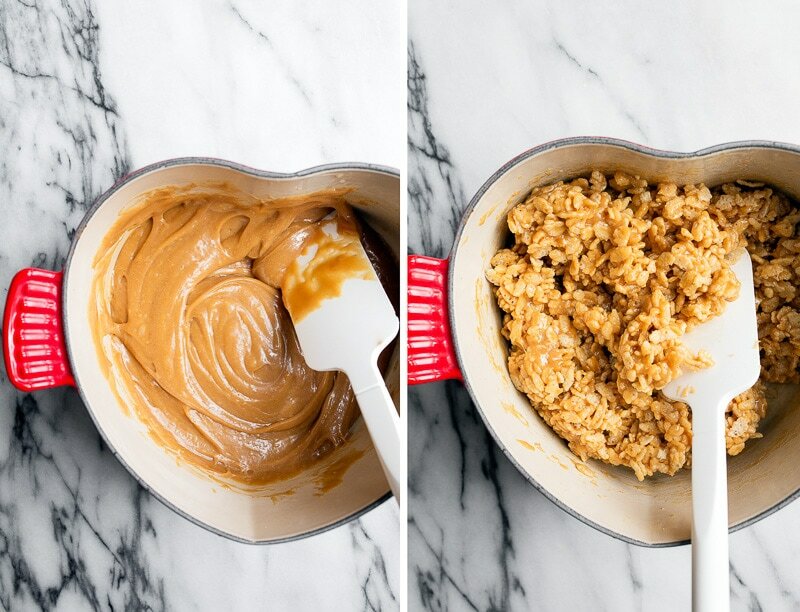 In a small 1-quart sauce pan, heat the peanut butter, brown rice syrup and salt until smooth and melted. It might even bubble a bit around the edges--it's fine, but don't let it boil too hard. Turn the heat off, and stir in the powdered gelatin. Next, add the rice cereal, and stir until evenly coated. Press the mixture into the prepared baking pan, making sure it's flat and even. If you're making the chocolate topping: melt the chocolate chip and coconut oil in a small bowl in the microwave at 50% power. Stir every 30 seconds until evenly melted. 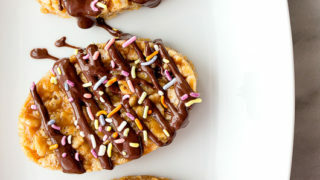 Drizzle each egg with the melted chocolate, and add the sprinkles on top. They’re so pretty! Please don’t let my kids see, okay? Oh the peanut butter! Love it. One of my favorite things ever. These healthy treats look wonderful. I’ve never tried brown rice syrup but I’ll be on the lookout for it now. Have you read Heidi Swanson’s book Near and Far? I swear every recipe in that book is amazing! These look great, definitely will be trying for my toddler! These are totally adorable Christina! I love rice krispie treats but don’t make them often because I’d probably eat the whole tray! I can’t wait to try this healthier version. I bet Camille will love them! I believe that I, too, have a cookie cutter that is in the shape of an egg, but in my case it was previously a round metal cookie cutter that has had the $%&# bent out of it. Cute treats! Thanks for another great recipe. Funny, today I just made a batch of your Chocolate Rice Krispy treats. I love the sprinkle of sea salt on the top of these treats. Glad I found you. Have a fabulous weekend. Wow– You have blown my mind. I never knew there was a healthy rice crispy treat… Looks awesome! Thanks, Christina!! Sounds great…but what about Nutritional info…please.